One of the focuses of eChallenges is how to encourage industry to make better use of ICT developments. So it's the perfect place for GridTalk to release its 9th GridBriefing - which focuses on how grid technologies can be used outside the academic arena - particularly in the commercial world. Grid technologies can help organisations in both the public and private sector provide enhanced processing power, access distributed resources and form stronger collaborations. Although transferring both the technologies and expertise created by the grid community isn't always easy, a number of projects are working towards putting grid in business. GridTalk's new GridBriefing takes a look at the issues involved on the road to adoption of grid technologies, featuring case studies and opinions from those working towards realising this aim. 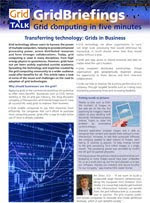 The briefing can be downloaded for free at the GridTalk website.